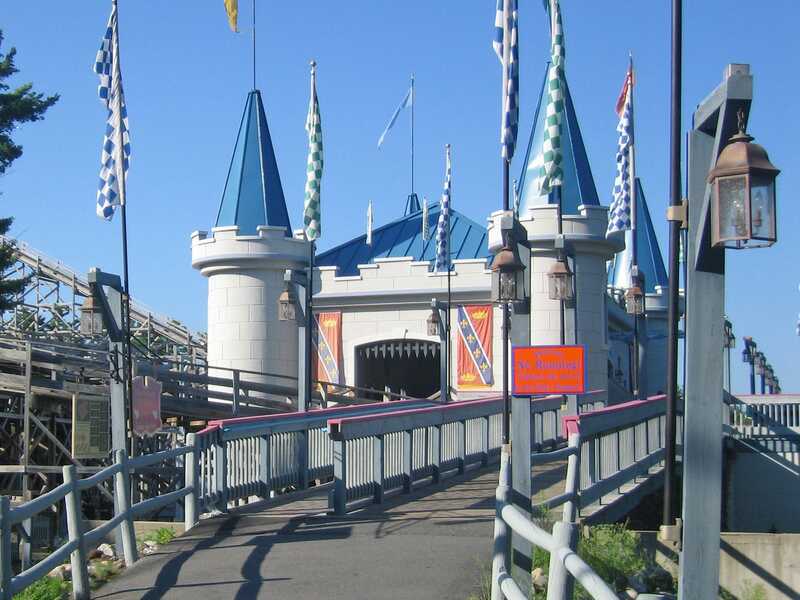 In the days before this trip we decided to make insert three small kiddie parks into this morning even though doing so would mean less time at Palace Playland, Funtown Splashtown USA and Canobie Lake Park. The main reason for the change was a rare attack of sanity; our original plan would have had us driving for almost seven hours after a day at a big park, which really wasn't sensible. It goes without saying that we could have just moved our hotel and not visited extra parks, but that would have been silly; we were close, so we decided to stop! 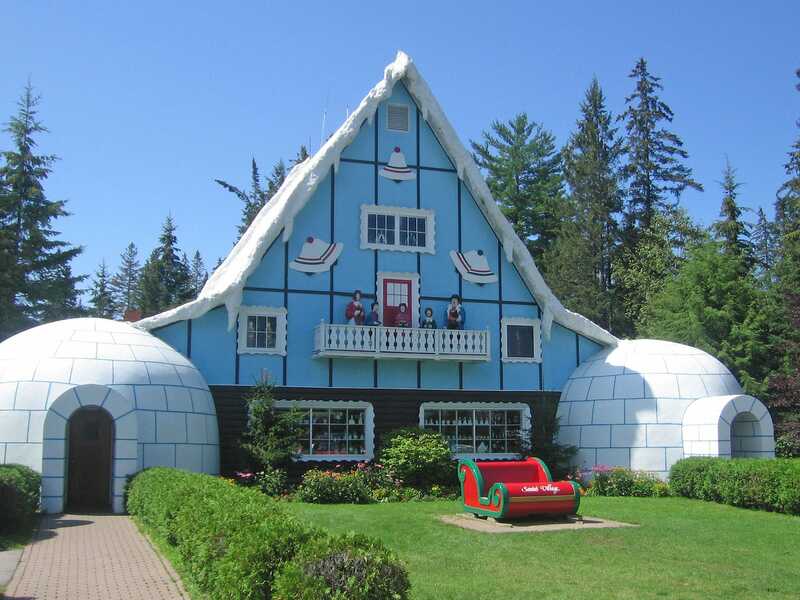 Santa's Village is a particularly nice kiddie park in New Hampshire, marked by friendly staff and quality theming throughout. Case in point was the extremely enthusiastic ride operator on Rudy's Rapid Transit (#869), who was jumping up and down and waving his arms in the air as the train passed through the station. A large tivoli is nothing particularly special of course, but this one was enjoyable and ran well. We rode the Giant Wheel as it provided a good photo angle on the coaster, before making our way over to the Great Humbug Adventure dark ride. This was a fairly typical shoot the targets attraction, but had the benefit of larger target areas than usual, which were much easier to see and hit. The designs were not altogether unlike the Senyo-built versions in Japan, rather than the more common Sally models seen everywhere. It is fair to say that my ability to hit a target is somewhat substandard, due to medical reasons, and for this reason the bigger target areas allow me to enjoy the ride far more. My score was still below average, but at least I was able to actually hit something! We decided to pass on the log flume, and everything else was targeted at people a great deal smaller than we were. Nevertheless, we spent some time walking around and taking in the atmosphere of the place, noting some of the tiny details; street signs for things such as Ho Ho Ho Boulevard, and a signal crossing which, instead of ringing as might be normal, played a few notes of Jingle Bells. The place certainly has the atmosphere to be the spiritual home of Santa, but for one thing; the absence of snow. However, unlike so many other parks in this country, it is possible to visit in December. Guests to the area should do so! 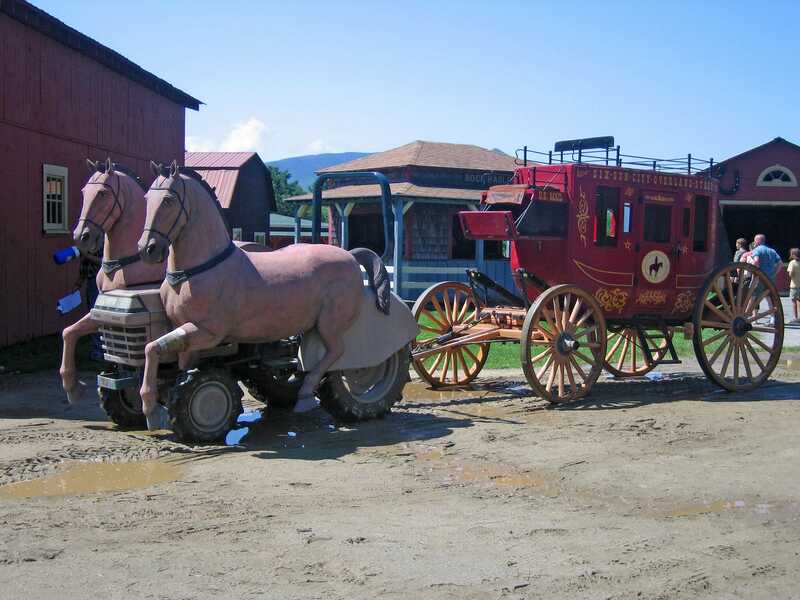 This park was known as Six Gun City at the time of this trip report. After the wonders of Santa's Village we were brought rapidly back to reality by Six Gun City, a park that can be summarised rather succinctly by the fact that their new attraction, Gold Rush Express (#870), has been built on a large concrete slab that at one stage might was part of the car park. You can still see some of the lines where cars once parked. As for theming? Well, the ride has green coloured track, which I'm sure has something to do with the midwest theming found in the entrance area of the park. There were a few other attractions; two token waterslides representing the water park, a boating lake, go karts, and laser tag. Nevertheless, we did not find anything that in our view justified the $18.95 admission fee. The coaster certainly didn't. There was one little oddity we noticed on the way out the door. Two days ago we were introduced to the nation's only diving horse. Six Gun City appears to have crossbred a new species for the sole purpose of transportation, pictured above. Park scientists might well have consider patenting this creation were it not for the fact that any royalties would surely be negligible. Story Land is somewhere every small child should be brought to; it has beautiful theming and a decent selection of rides to please both the young and the young at heart alike. Due to wait times we decided to pass on both the log flume and rapids rides, but we did partake of the Polar Coaster (#871), a Hopkins-built attraction that takes advantage of the park terrain to provide a decently long ride without ever dropping more than five feet at a time, making it perfect for small children trying roller coasters for the first time. Two trains were in use too, which kept the line moving well. We also tried out the Slipshod Safari Tour, a gentle journey through a forest full of animatronic creatures, with some entertaining touches, such as the stripy paint shop (for Zebras needing a makeover) and the toll bridge with different vehicle sizes being charged different numbers of bananas. As with Santa's Village earlier in the day, though, the real charm of the park for us was walking around the place and admiring the cleanliness and theming. Ten out of ten. Palace Playland felt very similar to Jenkinson's Boardwalk, with the only real difference being a slightly more adult selection of rides, albeit an unimaginative listing largely from the Zamperla catalogue. There didn't appear to be any custom attractions, and there were no dark rides that we could see. Having said that, there were still several rides for the younger folks, such as Orient Express (#872). Even we wouldn't have made a special trip to the park if that was all there was, mind; the draw for us was a Galaxi (#873). We arrived at another Galaxi (#874) just ten minutes after leaving Palace Playland, although this one had one marked difference from the other, as it ran single car trains rather than two cars chained. The sensations were largely the same aside from a moment in the middle of the course when the train slowed sufficiently that I thought it was going to get stuck on the anti-rollback. It made it round, fortunately, giving us one more credit in the process. The main draw at this park, however, was the rather good wooden coaster Excalibur (#875). Park management have evidently invested in the theming of their star attraction, with the station facade being designed as a large castle. Better yet, they've designed in a queueing system that allows riders to choose early on whether they want front seat, back seat, or any available seat. It would be so nice if other parks did this. We felt that the coaster was primarily a front seat ride. The first half of the layout from that end of the train was loaded with airtime and the typical furious intensity typical of CCI. Unfortunately the second half felt a lot less exciting; while there were some helices and a few more drops they lacked the energy of the first portion. It was only in the approach to the brake run that it seemed like things were getting going again. In the back seat there was no perceptible airtime, and a few potholes on the track meant that things were less comfortable than they might have been. We arrived at the final park of the day a little after seven in the evening, and promptly joined the line for Canobie Corkscrew (#876), reasoning that we might as well save the best for last. All the Arrow Corkscrews ride in the same fashion, making this one at best unremarkable. The powered coaster Dragon would also have been unworthy of note were it not for what is unquestionably the oddest loading procedures we have ever seen in a park. The operator would allow four people through the gate, wait for them to be seated, walk up the train to check their harnesses, then walk back to the entrance, repeating the procedure until each row was filled. This was, as you can imagine, not entirely the fastest way to load a coaster train. Better yet, having got the train full, she proceeded to do another full check of the restraints (a good idea to be certain, but with this it probably wasn't necessary to do another check beforehand). The net result was a train every eight minutes or so. Fortunately it wasn't a particularly popular ride; otherwise there might well have been mayhem. 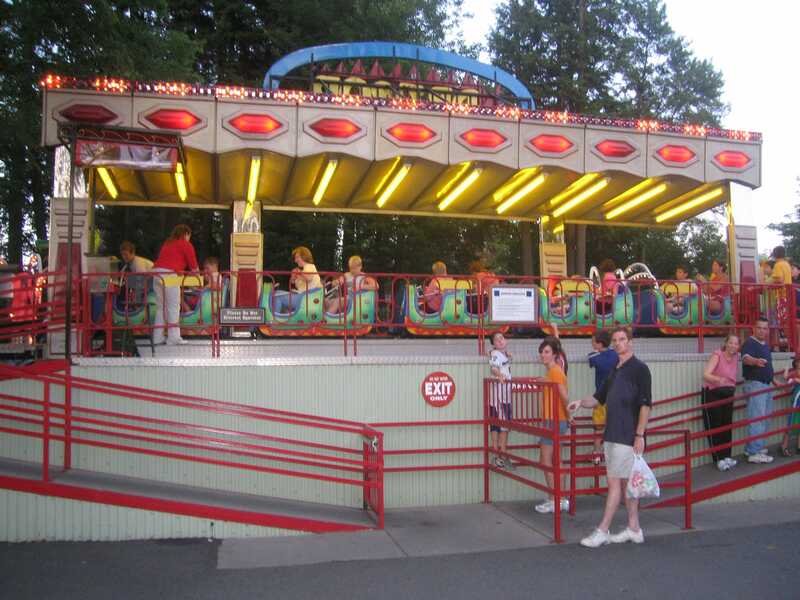 Yankee Cannonball (#877), on the other hand, was a popular ride, with the longest wait of the evening. It went quickly enough, however, as a friendly local had struck up a conversation with us, and before we knew it we'd gotten to the loading platform. From the front seat we found a positively superb wooden coaster, easily a nine out of ten, and a great way to end the evening. My only regret was not being able to ride a second time, but with a three quarter hour wait and a long drive to the hotel ahead we elected to give it a miss.